Firefighters work Wednesday to extinguish a fire that destroyed two buildings and damaged several others at the historic Fryeburg Fairground. An accidental electrical malfunction is believed to have caused the massive fire, a state fire marshal's office investigator said. 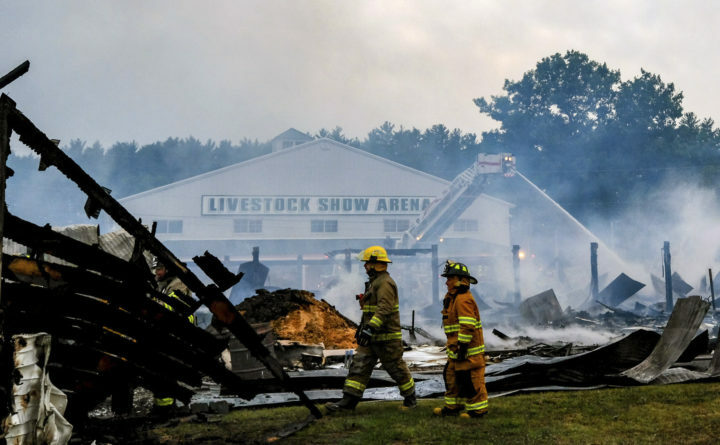 FRYEBURG, Maine — The Maine fire marshal’s office says the blaze that destroyed two buildings and damaged several others at a historic fairground was accidental. The fairground is home to the state’s largest agricultural fair, which is a tradition that dates back 160 years.